By now, you’ve probably heard something about the city’s update to the Comprehensive Plan. This massive undertaking has been ongoing – in one way or another – for years now (roughly since 2007 if you count Vision PDX as part of the process). You’ve probably heard that is important because it helps to set the policies and direction for where and how Portland will develop over the next 20 years. If you have interacted with the 2035 Comprehensive Plan Update, you have likely also discovered that its importance is only matched by its complexity. Depending on how you slice it, the update process includes three to five steps, each of which include between one and eight elements, each of those elements has multiple phases, and some of those phases have multiple draft documents. The result is a labyrinth of overlapping deadlines, numerous maps, multiple committees, and endless documents. 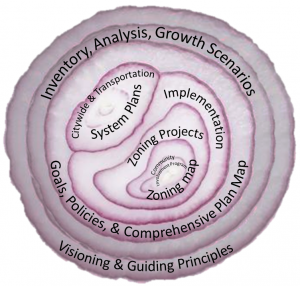 Increasingly, I have started to think of Portland’s Comprehensive Plan update as an onion. It is a necessary ingredient, it has many layers, and it sometimes can bring a tear to your eyes. Here’s my attempt to boil down the onion into digestible sized bites for you. Why are we using an onion at all? Comprehensive Plans in the United States date back to turn of the 20th Century when cities began to see the need for coordinated goals and policies around land use and infrastructure. As part of the statewide planning goals (http://www.oregon.gov/lcd/pages/goals.aspx) that were adopted by the legislature in 1973, Oregon requires cities to adopt Comprehensive Plans. The current onion has been in place in Portland since 1980. There is both a state mandate and a practical need – the city has changed a lot since 1980 and grandma’s recipe could use some tweaking – to update it. In a sense, we are all cooks. A Comprehensive Plan is supposed to reflect the community’s values and desires. Starting with visionPDX under Mayor Tom Potter and then the Portland Plan under Mayor Sam Adams and the current Comprehensive Plan update, there have been countless meetings, comments, and other forms of public involvement. The community input, as well as technical analysis mandated by the state, has been thrown into the pot by city staff at the Bureau of Planning and Sustainability, Portland Bureau of Transportation, and other bureaus, to create the dish that is now before us. Ultimately, City Council must approve the cooking and send it to the master chefs at the State of Oregon to make sure the dish goes well with the regional (Metro) and state planning requirements that are already served on the table. After that, we all get to sit down for a 20-year feast. What are the Onion’s layers? In its most simplified form, the Comprehensive Plan includes three components: inventory and analysis, policy choices, and implementation. The second two elements are the most complex layers, which I will try to peel back for you. What is it? : This is the guiding document that presents the city’s long-term goals and the policies and projects intended to achieve them. It is broken up into topic areas including Community Involvement, Urban Form, Design and Development, Housing, Economic Development, Environment and Watershed Health, Public Facilities and Services, Transportation, Land Use Designations and Zoning. Additionally, it includes the Comprehensive Plan map, which helps direct what can be built and where in the future, and the Citywide Systems Plan, which plans for future infrastructure needs like water and sanitary sewer. Why it is important: This is essentially the working document for the city for the next couple of decades. It can be updated from time to time, but the bulk of what is presented is the onion we will be eating until at least 2035. Where are we in the process? : The Planning and Sustainability Commission passed a recommended draft to City Council in August. City Council will begin public hearings on November 19. Council members can make amendments to the draft before they vote to adopt the entire package sometime in the new year. Public testimony is still being accepted in written form. You can also testify in person. Hearings are currently scheduled for November 19, December 3, and December 10. What is it? : An effort to update the development review process and to create new zoning standards for large campus institutions such as hospitals and colleges. Why it is important: Colleges and hospitals have been a source of significant job growth. Many of the large institutional campuses are surrounded by residential neighborhoods. Growth can present a challenge to nearby neighborhoods. The project aims to direct how institutions physically grow in the future, while addressing potential offsite impacts like traffic, noise, and building scales. Where are we in the process? : A draft proposal will be released in early November and sent to the Planning and Sustainability Commission. The PSC is slated to hold a public hearing on December 15. You will be able to testify in writing prior to then, as well as at the hearing. What is it? : A project that will revamp the zoning designations and code that dictate what can and can’t be built in mixed use zones along corridors (Hawthorne, Foster, etc.) and centers (Woodstock, Hollywood, etc.). It addresses things like size, design, and allowable uses. Why it is important: An underlying principle in the draft Comprehensive Plan is that much of Portland’s new growth will be directed to mixed use zones in corridors and centers. The code that comes out of this project will significantly influence the physical development of our future residences and commercial buildings. Where are we in the process? : A discussion draft is currently out with BPS staff accepting feedback through November 16. After that, a proposed draft will be submitted to the Planning and Sustainability Commission which will then submit a recommended draft to City Council. You can testify in written form or in person during each of these steps. The first hearing with the Planning and Sustainability Commission is scheduled for February 9. What is it? : A revamp of the underlying zoning that dictates what can and can’t be allowed in areas zoned for industrial and general employment. It includes changes to the zoning code and a new “Mixed Employment” zoning designation to focus future job growth in areas where there is currently a jobs/work imbalance. The bulk of this project impacts current industrial areas like the Portland Harbor and Columbia Corridor. Why it is important: The city’s supply of land that is able to accommodate industrial uses is tight and this project aims to improve efficiency of existing industrial land through policies and zoning code changes. Additionally, it proposes to change the zoning map to include Mixed Employment sites – most significant in our coalition area, is a stretch of SE 82nd Avenue between Division and Stark. This is being done, in part, as an effort to bring jobs closer to where people live. Where are we in the process? : A draft proposal is making its way through the Planning and Sustainability Commission. A recommended draft will be sent to City Council for deliberation in the spring. You will have the opportunity to provide testimony to City Council between now and then. What is it? : The guiding document for how and where future transportation investments are made. It includes policies, a list of capital projects, and a financial plan. Why it is important: Changes in land use – population and jobs growth – impact our transportation system, and vice versa. The coordination of land use and transportation is important for future movement of goods and people. The list of capital projects also is important because some federal and state funding sources require projects to be on this list. Where are we in the process? : A Discussion Draft has been released and feedback can be submitted to PBOT staff through November 13. A proposed draft will be released in mid-December with a hearing in front of the Planning and Sustainability Commission set for February 9. What is it? : Portland has a two-map system. The Comprehensive Plan map is the long-term vision for what can be built and where. The Zoning Map is what can be built today. This is an update to some residentially and open space zoned properties. Why it is important: For the most part, the Comprehensive Plan map and the Zoning map are in alignment. If a property has a Comprehensive Plan map designation of R5 (one housing unit per every 5,000 square feet), chances are it also has a zoning map designation of R5. There are exceptions, however, and many of these exceptions are in our coalition area. The bulk of the exceptions are properties that were designated as R2.5 (one housing unit per every 2,500 square feet) on the 1980 Comprehensive Plan map, but have R5 designation on the Zoning Map. Should these maps be brought into alignment and, if so, how? This component of the Comprehensive Plan will address this question. Where are we in the process? : A Discussion Draft has been released and feedback can be provided to BPS staff by December 11. A proposed draft will be sent to the Planning and Sustainability Commission in mid-January with a PSC hearing scheduled for February 23. When are we done talking about onions? 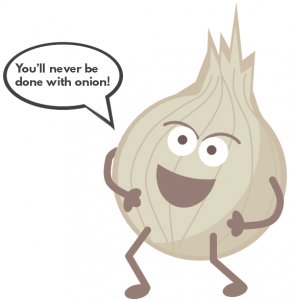 If the Plan goes according to plan, City Council will pass the onion on to the state sometime in 2016. The state will give its blessings in 2017 and the Plan will go into place in 2018. Whatever changes have been made to the two maps, as well as any zoning code changes, will govern development from then on. This doesn’t mean we are entirely locked into today’s decisions for the next twenty years. Zoning codes can change and there can be amendments to both maps. Items can move on and off the capital projects lists. While some of the ingredients may change a bit, the bulk of the recipe will not.